We provide our customers with professional presentation recording and webcasting services. Our team has been webcasting for more than 10 years, and has worked with all the major streaming technologies, including Real Media, Flash and Windows Media. 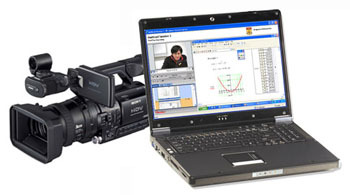 Our current webcasting solution relies on laptop direct-to-disc recording and state-of-the-art digital video cameras. We don't bring a truck to your door. Everything is in a small roadcase that we can wheel into a theatrette, conference centre or training room. Yet we are prepared for every contingency, and can assure you of an excellent recording, even with just one day notice! For presentation recording, we connect directly to the presenter's machine using a VGA or DVI splitter and synchronously record presenter video and crystal-clear screen graphics. These two video signals can either be mixed into a single file, or recorded independently for viewing as a multimedia presentation using a customised player (such as the example shown at right). Iterate is a recognised expert in webcasting and Internet streaming media applications. We are currently participating in a trial of next-generation 3G wireless Internet services, which allows us to upload at 6 Mb/sec and downlink at and incredible 21 Mb/sec! Even with current mobile 3G service, we are able to webcast live from most locations without a leased line or dedicated Internet connection. Thus we are the first company in Singapore to offer wireless webcast origination, resulting in lower costs and faster deployment. A relatively new area of the business is social media services. These range from consultancy on product launches to coordinating Internet communications for all-day events. Video webcasts are part of the mix, but the offering can include dynamic scheduling to allow physical participants to meet up for face-to-face networking, live photography (with images automatically transmitted to projection screens or the Internet), and online forums for international audience participation. We also produce interactive marketing pieces such as thumbdrives containing conference or exhibition materials such as PDF documents, slideshows and video presentations, all using web technology for easy browsing. Please be sure to check out our showcase of recent projects and selected testimonials. It's not easy to give you examples of this work, because the solutions are installed onsite as part of our customer's infrastructure. But to give you a feel for our capabilities, we developed a content management system for Singapore Airline's (SIA) Safety, Security and Environment Division and we deployed a campuswide presentation recording solution for National University of Singapore (NUS). Other solution customers include GIC, CapitalLand, Duke-NUS Graduate Medical School and the Singapore General Hospital (SGH) Post Graduate Medical Institute.